By the middle of the 17th century, the atheism associated with atoms was a major barrier for those interested in moving the ideas forward. Fortunately, some natural philosophers were willing to address this issue directly. During the same time period, the change from natural philosophy as mostly thinking about the world to empirical science was creating a different environment in which ideas could be tested. We will look at a little of each of these movements in this post. Walter Charleton (1619-1707) concluded that atoms could not have just happened but because of their complexity must have been the work of a God. He studied Gassendi’s work carefully and in 1654 wrote a book, Physiologia Epicuro-Gassendo-Charltoniana: a Fabrick of Science Natural upon the Hypothesis of Atoms, Founded by Epicurus, Repaired by Peturs Gassendus, Augmented by Walter Charleton. With a title like that, the treatise certainly must have attracted some attention. Charleton’s basic thesis was that God caused atoms to exist and set them in motion. These fundamental objects do not intrinsically have properties such color, sound, heat, cold, etc. Instead these properties are a result of the motion and shape of the atoms. Thus, Charleton removed “the poisonous part of Epicurus’ opinion” (his words). It seems like a rather simple solution and is quite similar to the argument that creationists make today against evolution. But it seemed to have an effect on the thinking of the day. It also helped that Charleton wrote in English rather than Latin. Thus, his thoughts had a much broader circulation among English speakers who then as today were frequently weak in foreign languages – modern and ancient. At the time of Charleton’s and others’ efforts, the stage was also set for a significant change in the way science was done. Francis Bacon (1561-1626) had described a scientific method not unlike the one we think about today. 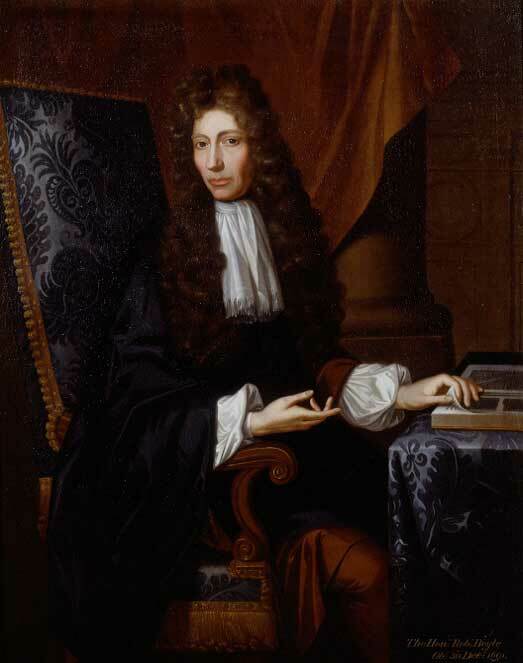 However, the person who put these ideas into practice was Robert Boyle (1627-1691), commonly considered the father of chemistry. Boyle is most remembered by students today as the person who stated the relation between pressure and volume in a gas – as one goes up the other goes down. Thus, his name appears in high school and college chemistry and physics books. However, Boyle’s Law about gases is only a small part of his accomplishments. Most importantly, he focused his work on experiments and observations. 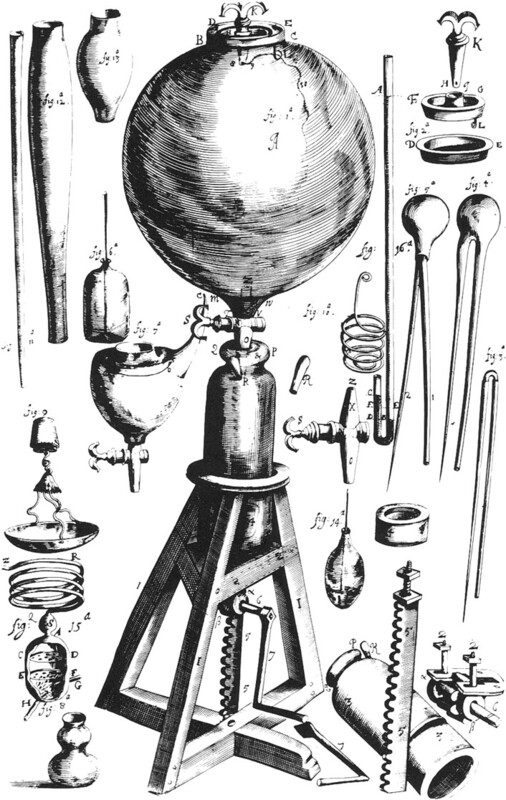 One of his assistants, Robert Hooke (1635-1703), designed an air pump which enabled them to remove air from an enclosure. (Hooke also has a law named for him, but it’s related to springs and is a different story.) As they conducted experiments in which they pumped out air, they were able to create a rudimentary vacuum. They discovered that in this vacuum sound does not travel, a candle cannot burn, and birds cannot live. Remember that the existence or nonexistence of a vacuum was critical to the opponents of atoms from Aristotle to Descartes. Now that one had actually been created, the momentum was on the atomists’ side. In 1661, Boyle published The Sceptical Chymist, in which he argued strongly against the four elements of Aristotle. He did accept some of the views of Descartes such as particles can move more freely in liquids than in solids. However, he differed from Descartes on the fundamental idea of a vacuum. Descartes concluded that matter was continuous and thus the vacuum did not exist. Boyle had created one – almost. Boyle did seem to hedge his bets a little. In much of his work he used terms such a corpuscles instead of using the word atoms. Further, he discussed the elements of which “all bodies are … made and into which all these can ultimately be decomposed.” He was clear that the ancient Greeks’ fire, water, earth and air were not these elements. But he was less clear about what the elements were. Boyle was an excellent person to enter the discussion while the conflict over atheism and the fundamental building blocks of matter was still going on. 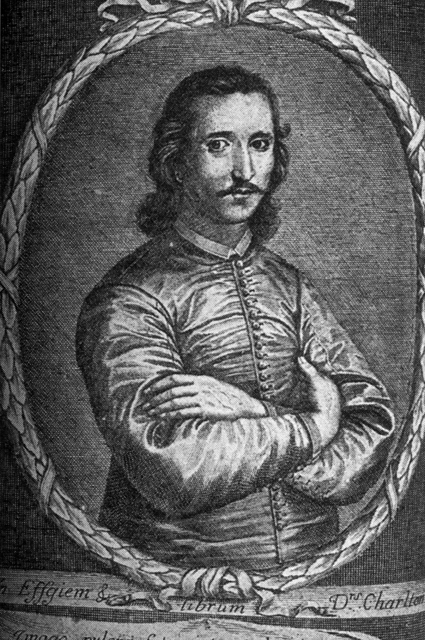 At age 11 or 12, Boyle was sent on a six-year educational tour of continental Europe. (His father, the earl of Cork, was one of the wealthiest men in Great Britain.) During this trip the young Boyle witnessed a very impressive thunderstorm. Apparently, the storm caused Boyle to have strong religious convictions that stayed with him the rest of his life. In fact early in his career (1659), he wrote Some Motives and Incentives to the Love of God. Thus, his religious beliefs were well known, and yet he conducted experiments that strongly implied that atoms were the primary building blocks of matter. Today, of course, we do not see these two as necessarily being in opposition, but as we have seen during the past few posts, the view was different from the 17th century. When I started these posts a year ago, I had expected to be close to modern times by now. However, I keep finding interesting (at least interesting to me) characters to investigate. Next time, we will move forward in time. We are getting close to one of the real giants – Isaac Newton.